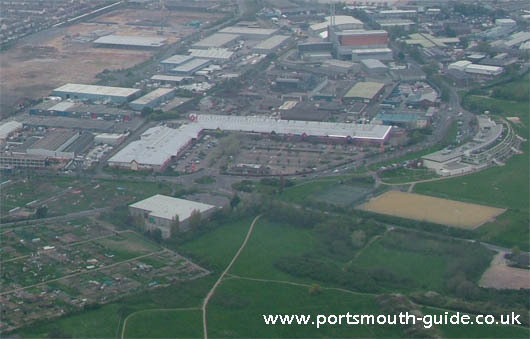 Ocean Retail Park is a shopping complex located close to what used to be Portsmouth Airport. The Shopping complex includes PC World, Comet, Curries, ToysRUs and many more shops. Portsmouth airport was opened in 1932. It served the city well with only having two air crashes in 1967. It was a foggy day and the landing strip was grass, the planes skidded when they landed and ended up across the Eastern Road but the 21 passengers and 4 crew were all okay. The airport was closed in 1973 after being open for 40 years due to it not being big enough for the larger planes. The airport hosted many air races and was often in the papers. On 11th July the airport received its first royal visitors when the Prince of Wales and Prince George flew into Portsmouth in two Puss Moth planes. From the airport they travelled to the dockyard from where they travelled to join their father, King George V, aboard the Royal Yacht Victoria and Albert. During the Second World War the airport was used for the Halifax Bombers to land and from which the Horsa troop-carrying gliders manufactured at Portsmouth were loaded. In 1955 the airport started to get back to peace time work but it was soon to close and on the 31st December 1973 it closed.